The Exiles welcome anyone who wants to learn our system of European Martial Arts and we operate an open-door policy, regardless of skill level, knowledge, race, gender, etc. However at this time, the group can only welcome members over the age of 16 for insurance reasons. The group consists of Certified Instructors and a team of senior students which work together to provide training to all levels of member from complete beginner to advanced. New members can expect to learn at their own pace in structured classes in a friendly non-competitive atmosphere. All members follow a very comprehensive regime of training and we supply insurance cover. Group members are broken down into 8 levels of development and work through each level via structured lessons and focused individual objectives. When you come to your first session you willl be given an overview of the group's curriculum, meet members and experience training first hand. After the initial free session there is a charge for training and, although we will supply loan equipment, there is a minimum group equipment list which members need to progressively purchase to enable safe practice. The equipment is not provided for directly by the group but is available from recommended sources and new students are given a checklist of equipment together with advice and guidance. 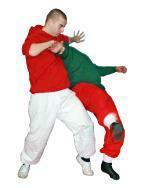 As with any Martial Art, especially those involving weapons, safety is paramount. The entire system is integrated, (so, for example, unarmed techniques working within the sword techniques). We follow a level grading system within the curriculum, see the published Primoris book for our first level. If you are interested in finding out more then please click here for the contact page.